One of the things that Bandai was well known for when they were doing plastic model kits was their 1/48 armor series. I'm not exactly sure just how many different kits were done, but the numbers must be near 100. They were very well done and have been collectors items for quite a number of years. Some have been issued under other company brands, such as Frog, but for the most part, they command a price that is in excess of what they retailed when new. Bandai basically stopped doing military subjects and hopped onto the Gundam bandwagon at the first opportunity. It is there that they concentrate all their development and work. Some say that because of the incredible popularity of these robot kits, Bandai is one of, if not the, top producers of plastic kits. I do know that they sell out with surprising rapidity so it is obviously what keeps the company afloat. The BMW motorcycle kit is one of the smaller ones in the series. It includes the motorcycle, sidecar and three figures. My particular copy came without decals as it appears from the stains on the box bottom, that the kit had been in a humid environment and the decals were no longer useful. The kit itself consists of two tan sprues and no clear bits. A substantial portion of the kit in in the three figures. Two are for the motorcycle/side-car combination and one is a standing figure. These have separate arms and helmets. The molding of the figures and the kit itself is superb. There is very little flash and no ejector pin marks in any places that will be visible when the kit is finished. In addition to the figures, there is a machine gun mount and gun for the front of the side-car, and a large container to fit on the side of the car. The instructions are quite good and give painting information where needed. There is also a section that shows how to paint and add details to the figures. A couple of good photographs of the real motorcycle and sidecar are shown to assist in construction. 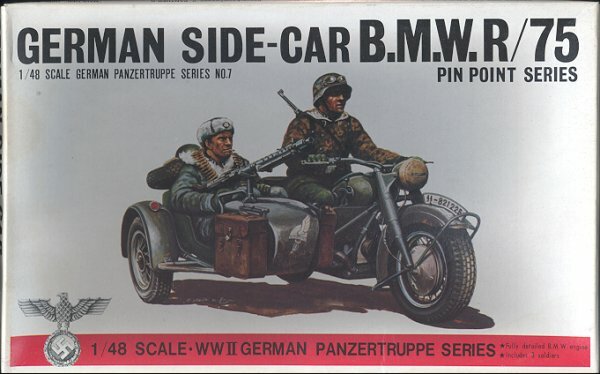 No overall color information is given for the cycle and sidecar, but the two most widely used colors were a panzer grey and a yellowish tan color. 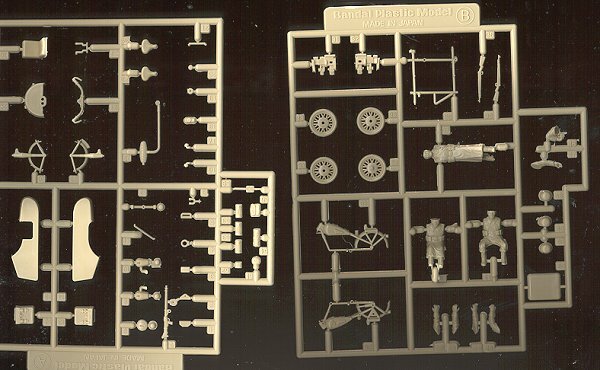 If you are into this scale for military vehicles, or want to add some interest to your 1/48 aircraft diorama, then this kit would be something that you should seek. They are not impossible to find as often you'll run across them at swap meets or on eBay.